"An estimated crowd of 20,000 people attended the first outboard motor race ever held on Lake Quannapowitt. The race was also the first of its kind to be held on inland waters in this region and attracted 45 entrants who participated in one of six events each event included a first heat, second heat and the finals. The Class E race determined the 'fastest boat.' The race was conducted by the Expansion Board as a sporting event for Wakefieldians and 'to bring visitors to the town, put the town on the map and stamp Wakefield as up to date.' While scores of people lined the shores of the lake, the balcony of Harold J. Hill's Wakefield Boat House was reserved for guests, with the wharf open only to the committee, officials and the press. According to published reports, 'the Common itself and the boathouse never saw such extensive smoking among women folk. Girls and women of all ages could be seen contentedly puffing away at their cigarettes." -- Text from calendar by Jayne M. D'Onofrio. Photo courtesy of Tony and Jean Giuliano. 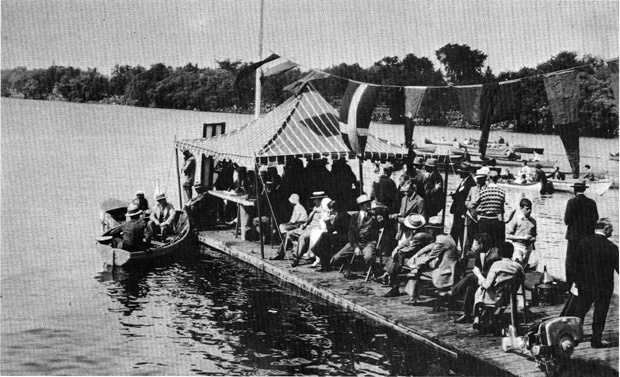 “Speedboat regatta, Lake Quannapowitt, summer, 1929,” NOBLE Digital Heritage, accessed April 20, 2019, https://digitalheritage.noblenet.org/noble/items/show/7076.